I have enjoyed Artist Lisa Snow Lady’s paintings for a few years now, ever since I met her at a Monotype Printmaking demo at the Seattle DANIEL SMITH store. After the demos were over I bought one of her demo monotype prints, a beautiful protea flower. It is always exciting to see an artists’ studio, to see what they are currently working, what paintings are hanging on the walls and on the floor leaning against walls and furniture. Lisa’s studio was lovely on the top floor of the BallardWorks building, filled with light, and her beautiful interior and landscape paintings. 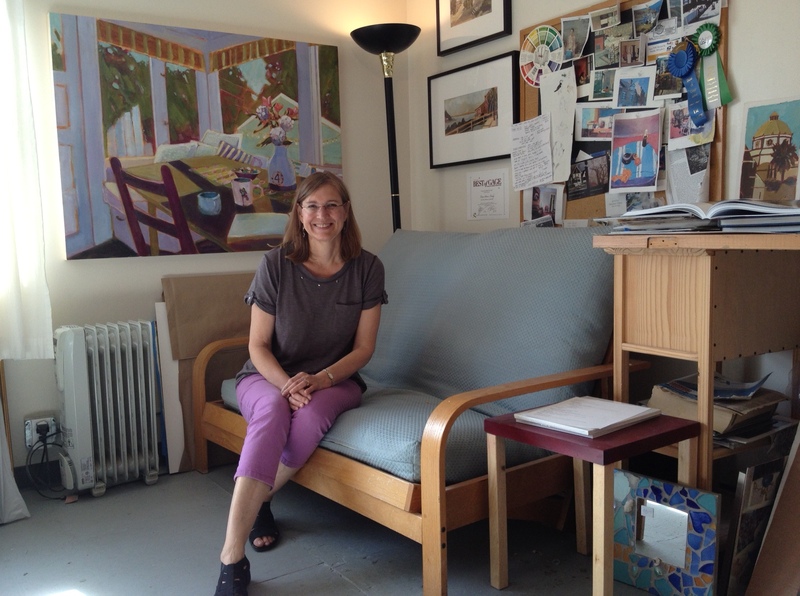 I visited Lisa at the end of June as she was preparing for an Art Show at the Simon Mace Gallery in Port Townsend for the month of July, titled “Inside Out”. The show featured her recent interior and landscape paintings, most of which were in her studio during my visit, so my timing was excellent! Lisa’s paintings always speak to me because of their lush brushwork, beautiful color, subject matter and a sense of calm and peacefulness. 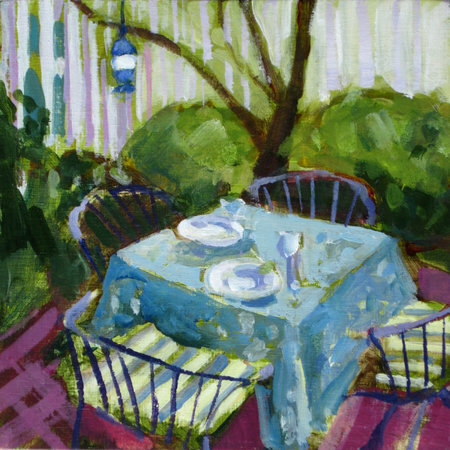 The subjects that Lisa likes to paint are the homes in her neighborhood, interiors of her home and a few friends, as well as landscapes of the local area. These are subjects that Lisa finds visually interesting and while they are representational, they allow her the freedom to work more abstractly and find the geometry and decorative patterning within the subject. When I look at Lisa’s paintings, it’s the colors that pull me in at first. She chooses beautiful colors that are expressive of her subjects rather than simply painting the representational colors in the subject. I asked Lisa what her favorite color is and she said aqua blues, colors I saw in many of her paintings that day. Lisa’s favorite painters are, Bonnard, Vuillard, Diebenkorn and Vermeer and you can see a bit of their influence in her artwork. While I was at Lisa’s studio, she showed me an exhibition catalog of Richard Diebenkorn works and we looked at some of his paintings. I had mentioned some of her paintings did remind me of Diebenkorn’s Ocean Park series, so Lisa wanted to show me some of the paintings that inspired her, the ones he painted in Berkeley that I had forgotten which were more referential landscapes than the Ocean Park series, and I could see more influence. 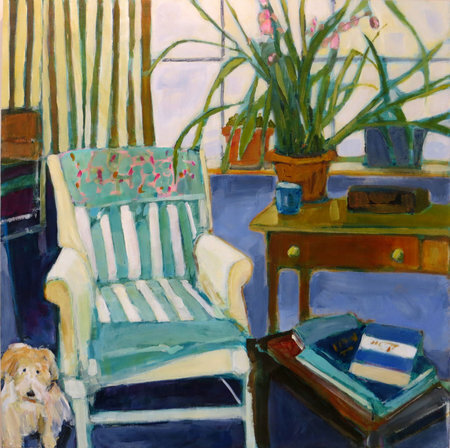 The other artists that Lisa admires, are Bonnard and Vuillard for their light and patterning and I see how their influences manifests in her paintings in some of the flattening of subjects through color, and their animation in brushwork and subtle patterns. Some of the things I enjoy when looking at Lisa’s paintings are how abstract they are when you look at smaller sections. You notice the beautiful colors and brushstrokes, then as your eyes move outward to take in the whole painting, the abstract section merges smoothly into a representational painting. While not a figurative painter, Lisa’s work does give you sense of the people who have occupied the space, and the space seems to be waiting for them to return. 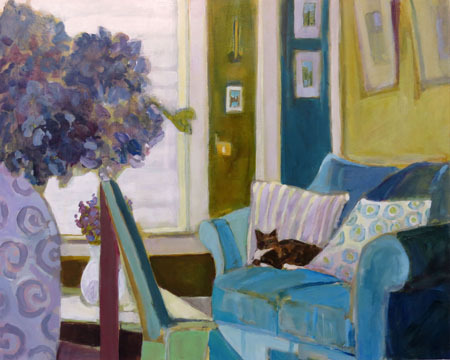 Sometimes a pet remains in the space, one of Lisa’s cats curled up on a couch, a white terrier almost off the edge of a painting , though they are not the subjects, they are part of the composition of the painting and add their quiet presence. Lisa works in several mediums; acrylic, watercolor and printmaking, but usually in acrylic, generally in the mid-size, 16×20 to larger, 30×40 range, but she also works smaller, such as a recent group of garden paintings that were 6×6. In June, Lisa won first place in the Landscape division at Gage Academy of Art for this year’s “Best of Gage” competition for her painting “Canal” . The prize was donated by DANIEL SMITH, part of which included DS paints and a few large stretched canvases, a bit larger than her usual size, which she is excited to paint on. 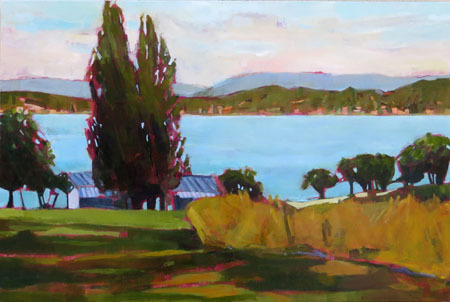 Another of Lisa’s landscape paintings was a named a winner in the recent art/East NW Landscapes, Grand & Intimate Exhibit in Issaquah. I want to thank Lisa for allowing me to come to her studio to chat with her and see her recent paintings. 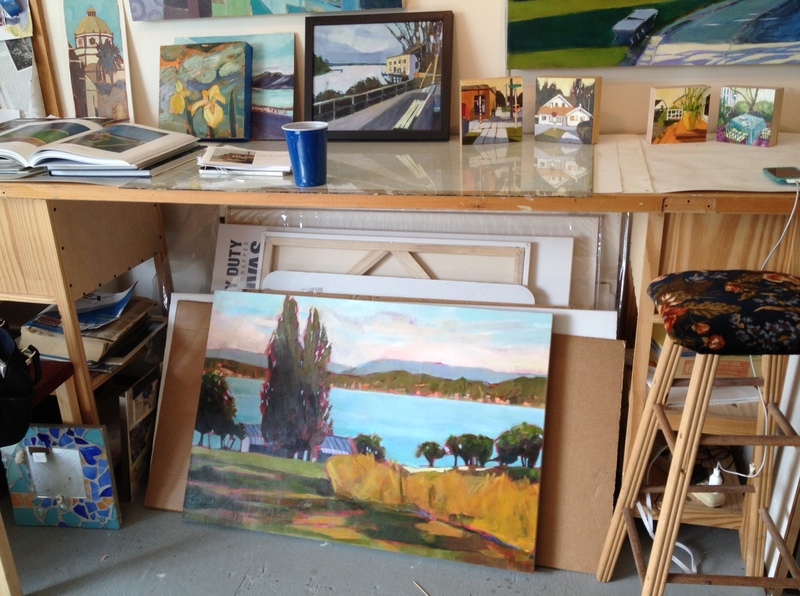 You can visit Lisa’s Studio too during the BallardWorks Studio Tours which happen during the Ballard Art Walk on the second Saturday of the month between 6pm and 9pm. I am a Real Estate Agent/Broker in the Seattle/Bellevue areas, if you have (or someone you know has) questions about Real Estate in the local area or needs help, please contact me, I would love to talk with you! This entry was posted in Art, Artists and tagged Art, Artist, DANIEL SMITH, Lisa Snow Lady. Bookmark the permalink.